And so I find that I am rather inexplicably entering into a Clematis phase in my evolution as a gardener. Miss Jane Hortaway insists that I need to catalog these three new Clematis from Soules Garden, plus the three I purchased a few weeks ago at the IMA Hort Society's plant sale and the two I've been overwintering, and learn more about each one before for I just plop them in the garden and move on to another phase in my evolution as a gardener. I know some will need support, especially the C. tangutica and C. 'Huldine' Another one, C. heracleifolia is more shrub like and I can just plant it out in Plopper's Field. There is one that is tiny enough for rock gardens, C. columbiana var. tenuiloba which I think for now I'll plant it in a bed where I'm sure to keep an eye on it. Another one, the native C. pitcheri, I think can scramble through other plantings. C. viticella 'Venosa Violacea' will definitely need support. 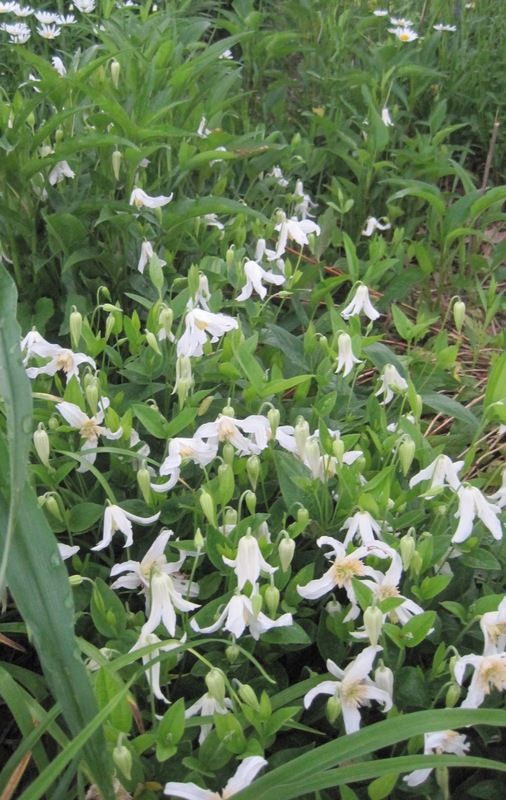 And C. 'Lord Hershell' only grows a foot tall, so I can plant it safely in several different locations. Finally, I have C. integrifolia to plant. It should have the same growth pattern of my C. integrifolia 'Alba', which sprawls and blooms where I planted it in Plopper's field. By mine own counting, the addition of these eight Clematis to my garden will just about double the number of Clematis in my garden, Dr. Hortfreud. And to think that growing up I thought of Clematis as just that big, garish Jackmanii that so many planted. I was never going to have that in my garden, and I'm still not, but many of its relatives are welcome. Thank you for listening to me ramble on about my Clematis phase, Dr. Hortfreud. Though I know what you'll really want to talk about is that wisteria and where I'm going to plant that in my garden. I'll write about that another day, I promise. For now, I need to get out into the garden and do some weeding before it rains or I'll be entering, once again, my weedy phase of my evolution as a gardener. Wowzer, Carol, that's a nice number of Clemmies. I would love to have more...and wish we had a nursery that offered some of the sweet ones you've added to your collection. Carol, C. Tangutica is a wonderful yellow bell. I think mine died with our lack of snow cover. You will love it. It needs a little support but is not a monster. My favorite is called 'Olga' have no memory of where I found her but she is pale blue, 4 petals with yellow center and shrub type. I confine her in a tuteur(sounds cruel). You have a wonderful collection! Wonder how many wisteria you will end up owning? I do love a nice clematis. 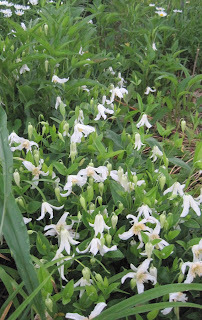 And those delicate ones look very lovely, though personally I rather like the garishness of the Jackmanii types. Good for you. 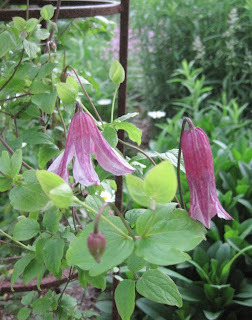 I was just saying to self today that I neeed more clematis. Some later blooming ones. I will look forward to hearing about your new habit, I mean clematis. There is a cure. But who would want it when the suffering is so much fun. I love Clematis! I had a Jacmanii growing on my mailbox at my previous house and it was gorgeous. I don't think they are garish, but everyone is entitled to their own opinion. People would stop by and take pictures of it. I had a Sweet Autumn growing on an arbor. At my current house, I have two Jackmanii growing across an old bench in my yard. I have a Nellie Moser on the left side of my garage and another on the other side of the garage. It's a light blue color and the variety is unknown. I need to find out. I have two more trellises to use and I'm thiniking of more Clematis! Serious plant envy right now! integrifolia, in my garden, is a weedy pest, self-seeding everywhere. I've donated it :) to several other gardeners.